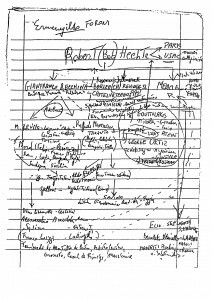 The ‘organigram’ is a handwritten organizational chart that was recovered in September 1995 during a Carabinieri raid on the premises of Danilo Ziccho (Watson and Todeschini 2007: 16-18). 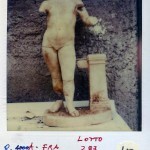 Drawn by dealer Pasquale Camera, it presents a view of the antiquities trade within Italy as envisaged by Camera in the early 1990s. 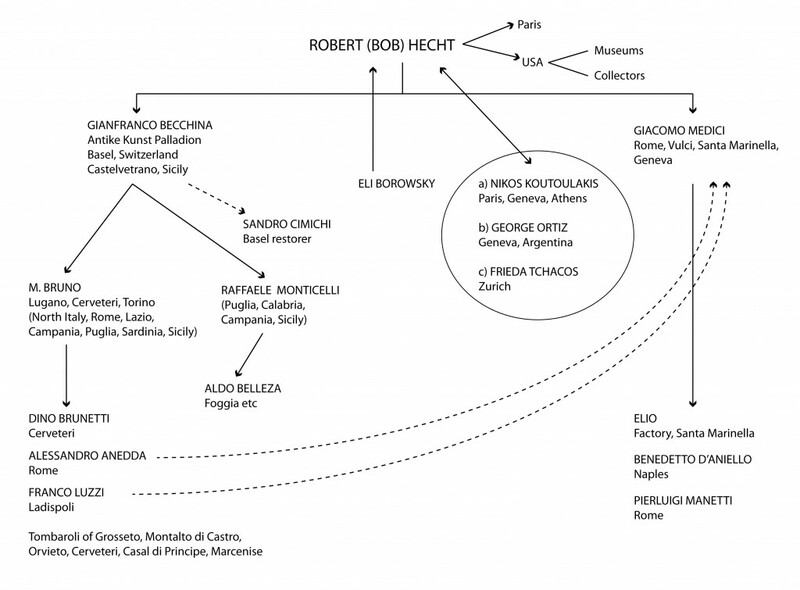 The US dealer Robert Hecht occupies a central place on the chart, with links to collectors and museums in the USA, to major antiquities dealers Nikos Koutoulakis, Eli Borowsky and Frieda Tchacos, and to the collector George Ortiz (who is in fact Bolivian, not Argentinian as suggested on the chart). Hecht is also shown to stand at the head of two chains of dealers and tombaroli within Italy, one orchestrated by Gianfranco Becchina, the other by Giacomo Medici. 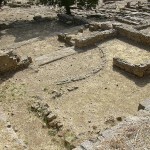 The assumption when the organigram was first discovered, which was later substantiated by investigations of Becchina and Medici, was that these chains were responsible for supplying Hecht with artifacts illegally excavated from within Italy that he would then sell on to museums and collectors in the USA (Isman 2011; Silver 2009). A notable feature of the organization presented on the chart is that the Becchina and Medici chains are largely independent of one another. Members of each separate chain referred to themselves as being part of a cordata, the Italian term for a group of mountaineers roped together (Watson and Todeschini 2007: 79). It was later revealed that dealer Nino Savoca headed a third cordata not shown on the organigram (Watson and Todeschini 2007: 150, 53). The organigram as interpreted by Watson and Todeschini (2007: 17-18) and Mazur (2006). Mazur, Suzan (2006), ‘Add NYT to Bob Hecht antiquities ring organigram?’, Scoop, 17 August. http://www.scoop.co.nz/stories/HL0608/S00171.htm, accessed 19 July 2012. 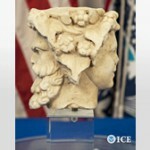 Watson, Peter and Todeschini, Cecilia (2007), The Medici Conspiracy (New York: PublicAffairs).